s I was taking an evening run in my neighborhood, I spied a lone chair across the street, appearing for all the world to be completely abandoned. And as I circled back on the second half of my run, discovered it still there. 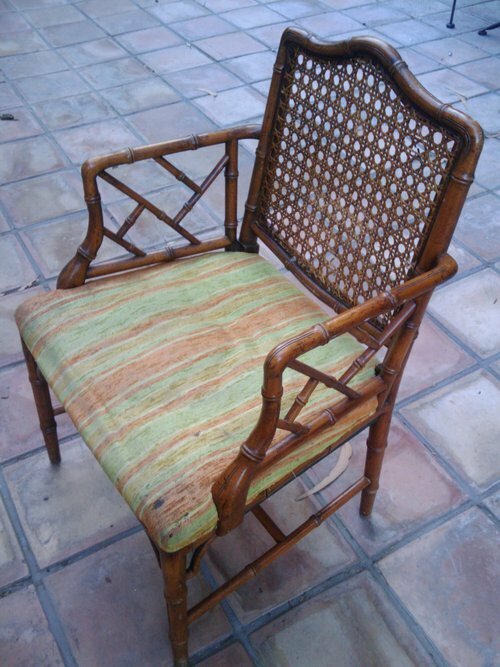 Lo and behold, a lovely vintage example of a faux bamboo Hollywood Regency side chair just screaming out to be white-lacquer painted and reupholstered in some high impact fabric. I hustled through the rest of my run to go get my car so I could come back and rescue said chair, crossing my fingers the whole way that it would still be there. Yes! Stay tuned. Next week’s project will be to visit the revered Michael Levine fabric store in downtown LA and take this chair from drab to fab.